Homeowners who are 62 years of age and older and who have equity in their homes can qualify for reverse mortgages. Say John Smith is 62 years old and has owned his home for the past 20 years and has been laid off over a year ago and is behind on all of his monthly payments. The above case will be a perfect case where reverse mortgage qualifications that will suit John Smith. For example, 62 years old is still fairly young so the maximum loan to value ( LTV ) for this age group might be 60% loan to value. John Smith is still responsible to pay his homeowners insurance and property taxes but does not have to pay any more mortgage payments until he either sells his home or until he dies. Mortgage lenders that specialize in reverse mortgages are mainly concerned with the equity homeowners have in their home. There are no pre-payment penalty with reverse mortgages. Homeowners need to be an owner occupant and cannot rent home and live elsewhere. Otherwise, they will be a violation of Reverse Mortgage terms. Again, reverse mortgages is not for everyone and the key is that borrowers need equity in home to qualify. For those homeowners with very little or no equity, reverse mortgages will be a difficult option. For those folks interested in reverse mortgages, reverse mortgages have higher rates and higher closing costs If interested in selling their home within the next year or two, they need to weigh in the fees and costs involved in getting a reverse mortgage. 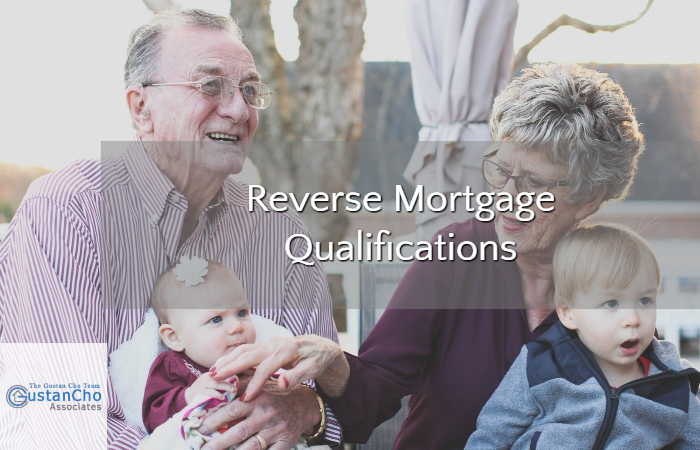 Homeowner interested in learning more about reverse mortgages, please contact us at Gustan Cho Associates at 262-716-8151 or text us for faster response. Or email us at gcho@loancabin.com. Quiana Williams NMLS 1267228 is a Senior Loan Officer with The Gustan Cho Team at USA Mortgage. Quiana is the Reverse Mortgage Expert living in California. Quiana can be reached at 760.440.8844 or email at quiana@usa-mortgage.com.